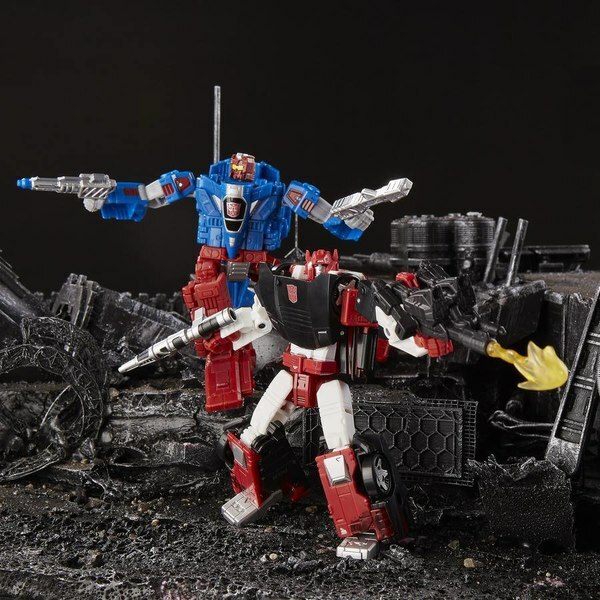 With the continuing support of the North American Masterpiece line, it was just a matter of time before MP-08 would be released outside of Japan. 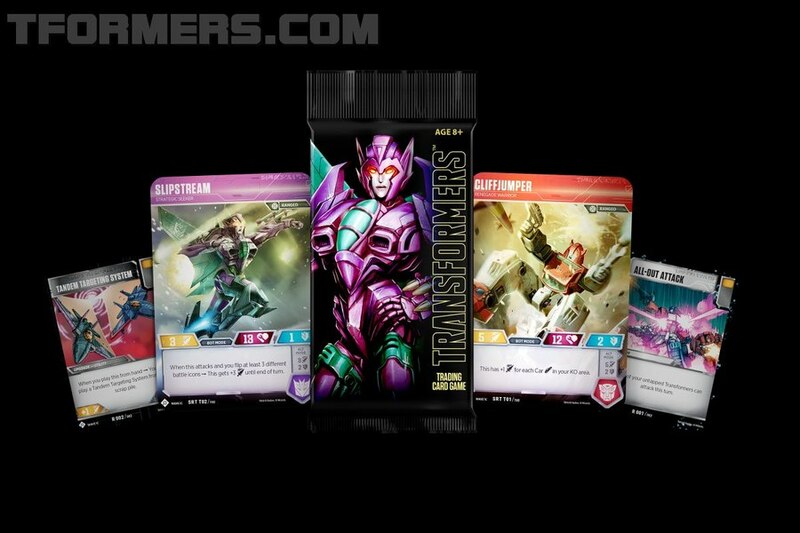 With the exception of Megatron, every core Masterpiece had been made available about a year after their Japanese release. Well...the time has come and non-importing Transformers consumers can now get their grubby hands on Masterpiece Grimlock. 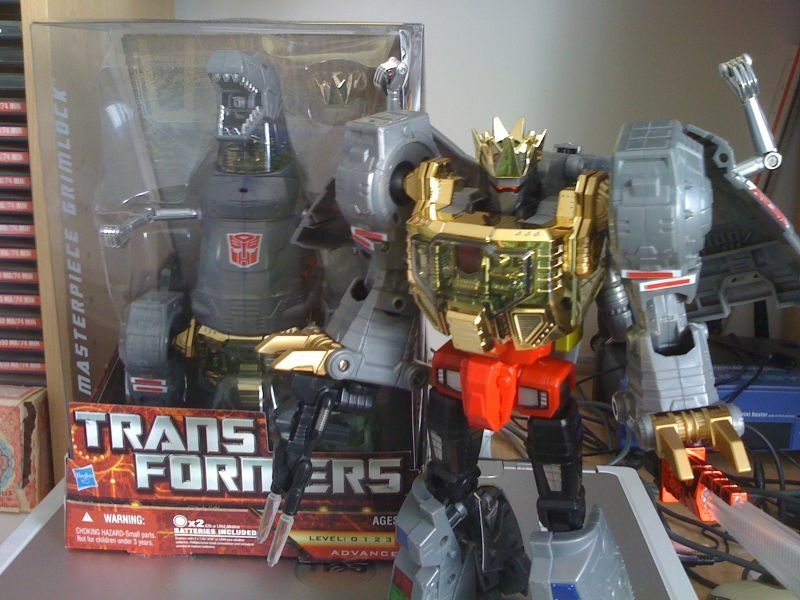 First sold at the 2010 San Diego Comic Con, Grimlock is now available to the general masses as a Toys R Us exclusive. What are you missing out on from the Japanese release? You do not get the “intelligence transfer cap”, bowtie, apron, serving tray and drinking glasses from the MP-08. Even though we do not get the bow tie and the serving tray, the little holes that were meant for these items to peg into remain. Other than that, we get his G1 double barrelled blaster and sword (slightly re-coloured from the JP version), both of which Grimmy holds very well. 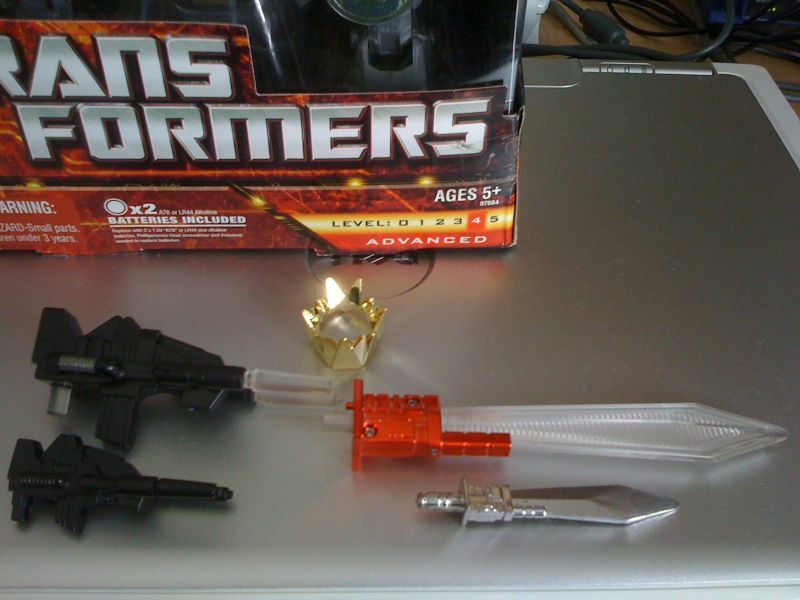 You also get the crown from the MP-08X, King Grimlock. There are only minor changes from the Japanese version - rounded teeth and claws. All the other gimmicks are unchanged, and Grimlock packs quite a few of those into his T-rex mode. His eye color can be swapped between red and blue, to match his appearance in either the G1 cartoon or the comic books. This is done by lifting a small door on the top of his head and rotating the eyes. Pushing down on Grimlock, while he is standing, pops his head up. Pry his mouth open and a button on the side of his head shuts it. Moving his tail from side to side makes his head turn. A nice detail is the molded flame thrower inside Grim`s mouth. 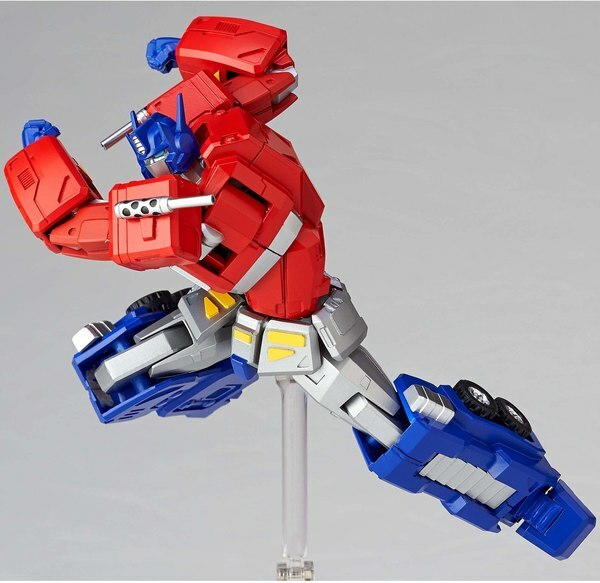 He is very articulated in this form – his legs are on a ball joint and his knees are double jointed. His legs can also twist at the upper knee. His weight is very well distributed and he can be posed in many dynamic ways. His tiny arms are on a ball shoulder and 90 degree elbow joint. Each of his 3 fingers can be moved independently. His head can look to either side and his tail can swing horizontally. 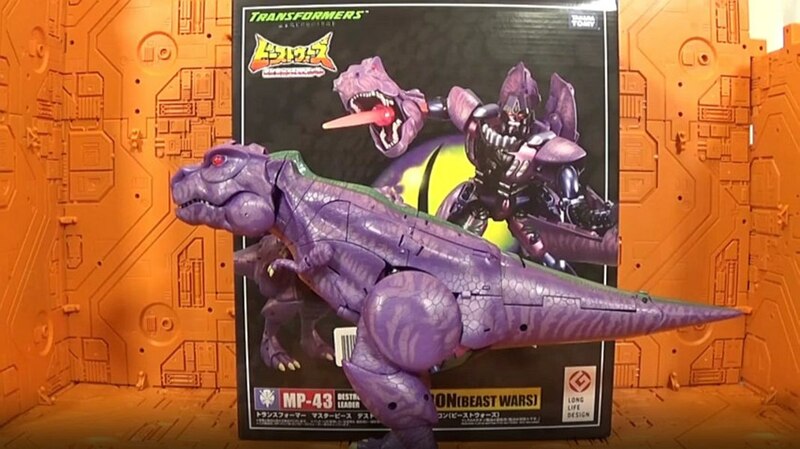 His proportions are accurate to his G1 toy and he is a good representation of, a now debunked tail-draging-dino-lizard idea, a robotic T-Rex. He has some robot kibble and joint gaps along his back and on his rear, but I think the angular and un-streamlined look suits this character. The detailed paint apps and articulation gives this dinosaur a lot of personality, which is quite a loss, since you are unlikely going to have Grim displayed in this mode. His transformation is very reminiscent of his G1 toy. First, split the torso in half and fold the 2 plates back. 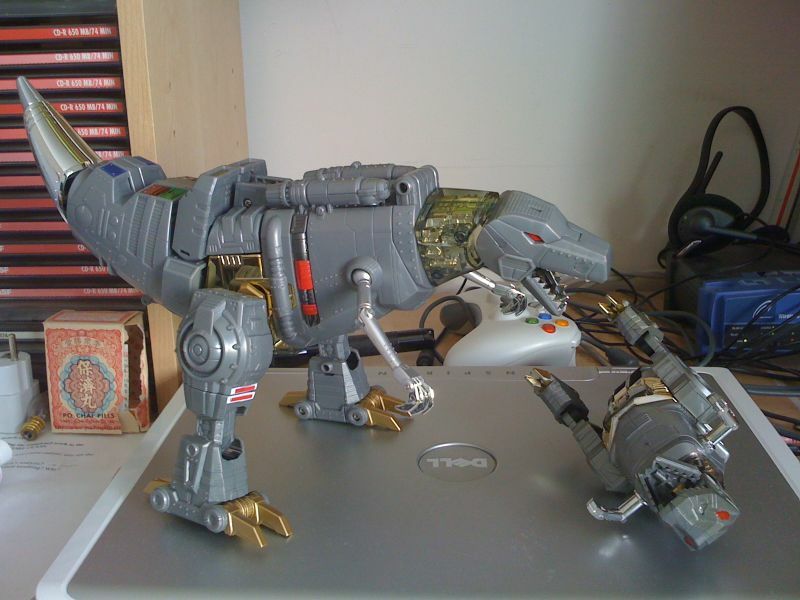 Tilt the dinosaur head back, lock it in place, and lift the Dinobot legs/Robot chest up. At this point, there is nothing holding the robot upper torso and arms in place, so he is quite floppy. Separate the tail at the tips and part the rest of the back/tail. After a series of folds, the plates on the tail collapse on each other and peg into place. Turn the feet, fold the tail, and rotate the booster jets into place. Slide the entire lower body up while holding the upper torso straight. A small peg on the lower torso slides into the upper torso. 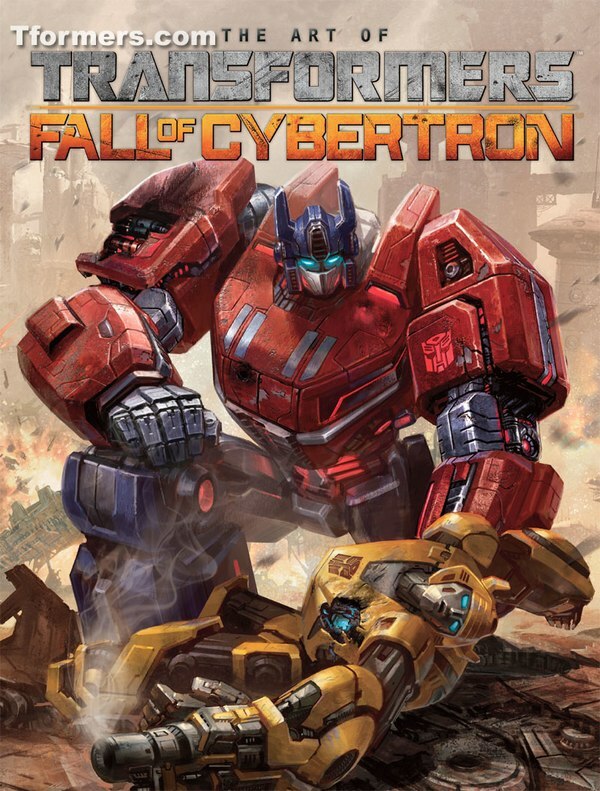 This reveals and Autobot faction symbol on Grimlock’s chest and holds the entire body in place. Flip open a tab on the wrist and flip the hands out. Like in his Dinobot mode, his visor can be swapped between red and blue. Either color is done using a metallic paint and is very cool to look at. The swap is accomplished by moving a red lever, on the back of his head, up or down. It’s a small lever but the metallic red paint does make it stand out. He also has a light up gimmick - a red LED built into his right hand lights up the sword blade or the gun’s barrels when they are plugged in. The downside is that the right hand is permanently affixed in a fist while his left hand has articulated fingers. The paint job matches that of MP-08, for the most part. Something I found unexpected was that almost all the shiny parts carried over from the Japanese version. The only observable difference I have noticed is that the gold chrome on the shoulder joint has been replaced with a dull gold. The TRU version has some additional paint apps – some silver on the upper thigh and some extra detailing on the hips and upper arms. Other than that, there seem to be no other differences from the JP version. His articulation in robot mode is pretty decent. His shoulders are on a ball joint, which enables the bulk of his arm articulation. The elbow is on a double joint but, due to the bulk of his arms, cannot bend past 90 degrees. Like the knees, the elbow joints click in place when you move them. His arms and wrist can swivel on a point. As part of the transformation mechanism, the wrist can bend a bit at well. 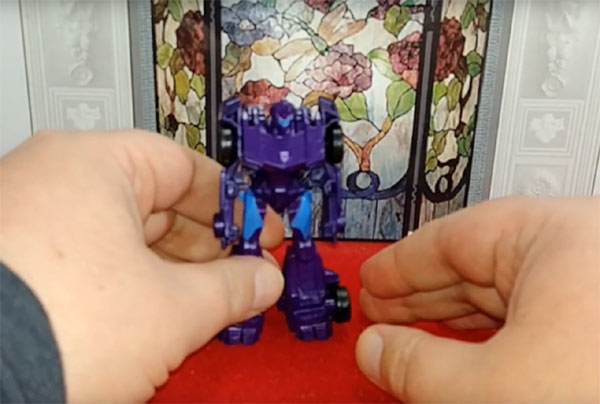 His hips are on a pin and swivel allow for a lot of movement – his legs can move back and forth, as well as side to side. On my Grimlock, they seem a little loose, but that may just be an isolated incident. He can bend his knees up to 90 degrees, but you have to move his tail out of the way to get the full 90. His toes can move as well. Grim’s head is on a ball joint and he can look around largely unrestricted. Grimlock has some dino kibble and the entire T-rex head hanging from his back, but that is the way he was portrayed on screen. Everything else is tucked away nicely – the way his tail folds to form his feet give him a very large and stable foot print. One thing that stands out about him in robot mode is his awesome head sculpt – it is one of the best representations of this character I have ever seen. 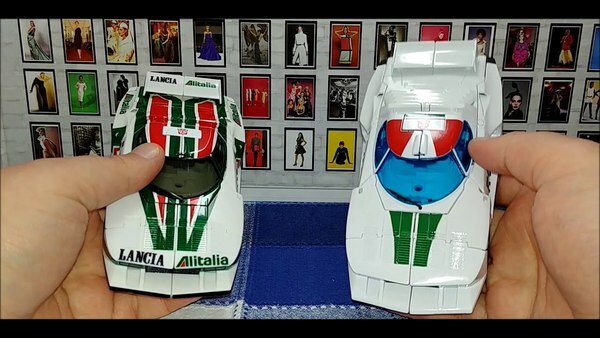 It is essentially a well proportioned and very detailed recreation of his G1 head, with just enough detail to not make it look cluttered. 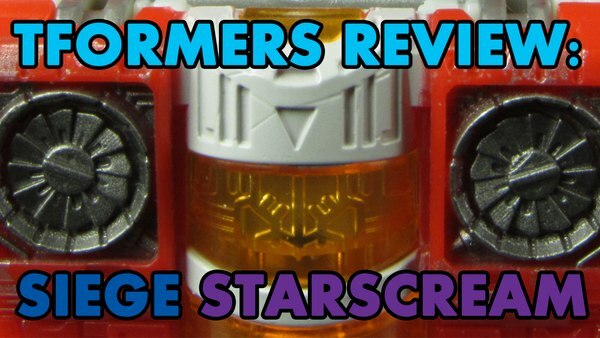 Small details such as bolts, intake vents and that awesomely shaped faceplate decorate his visage. 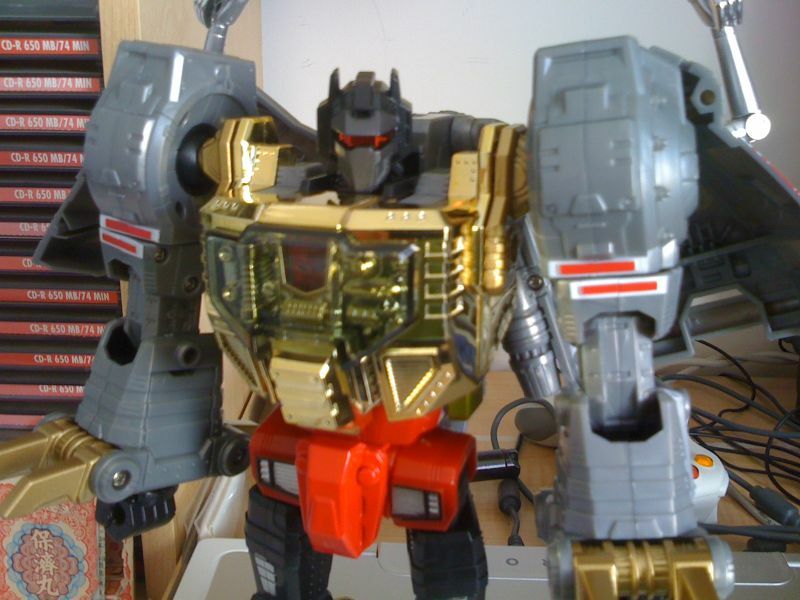 Compared to his TV counterpart, this Grimlock comes off looking rather stocky and short – probably because of his massive shoulders, forearms, shins and feet - but not in a bad way. His bulky frame makes him look very imposing. 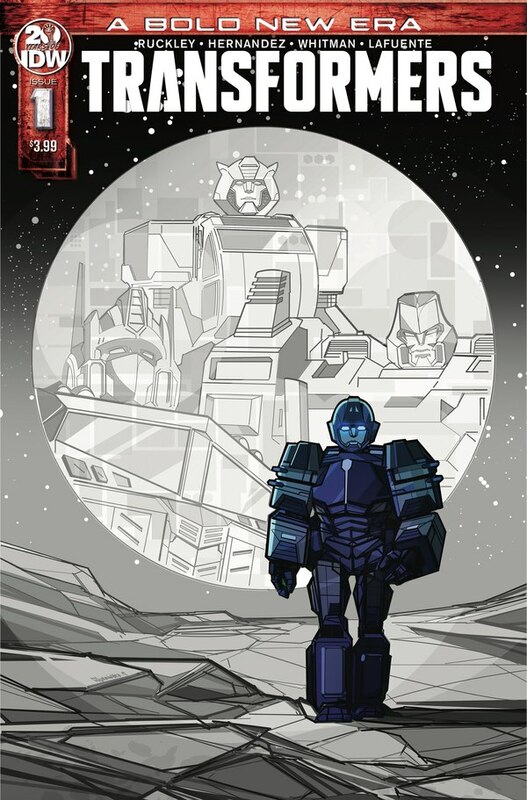 He is a very stylized interpretation of the G1 character and is a lot of robot in a small package. 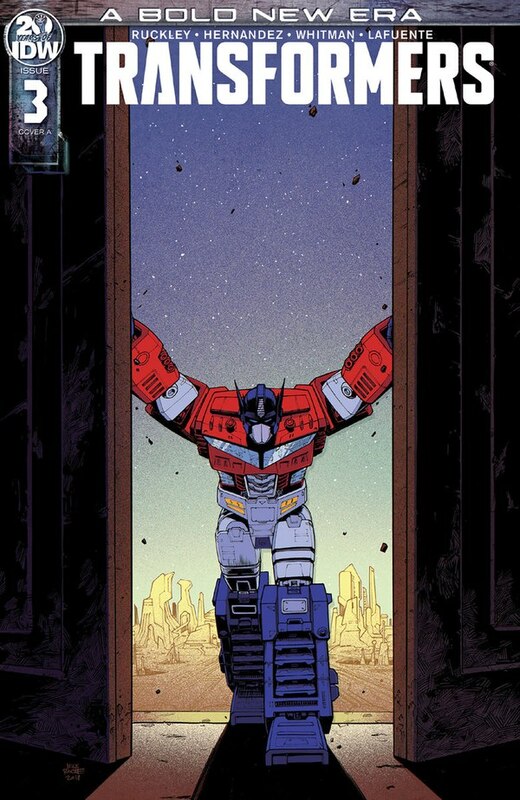 As a figure, he is quite a bit shorter than Masterpiece Optimus, although that may be because Optimus is an exceptionally large figure. 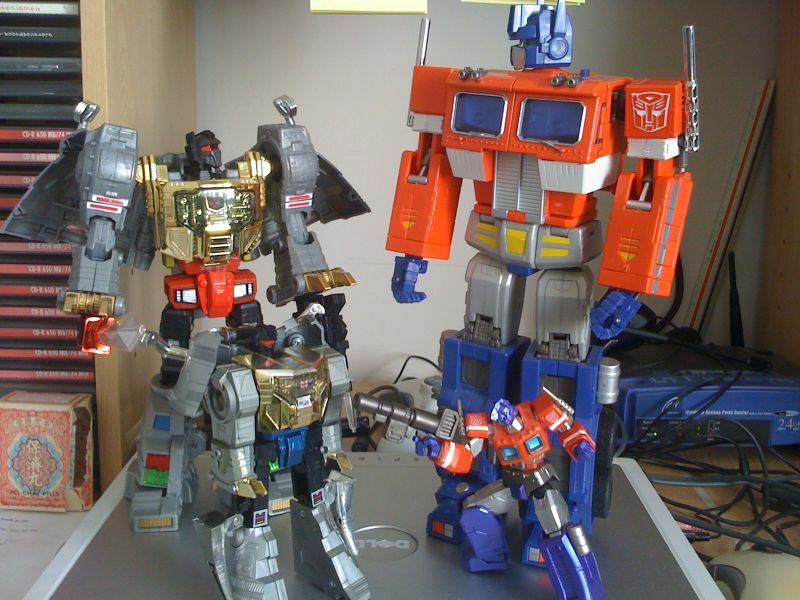 In other media, Grimlock is portrayed as being as tall as or taller than Optimus. 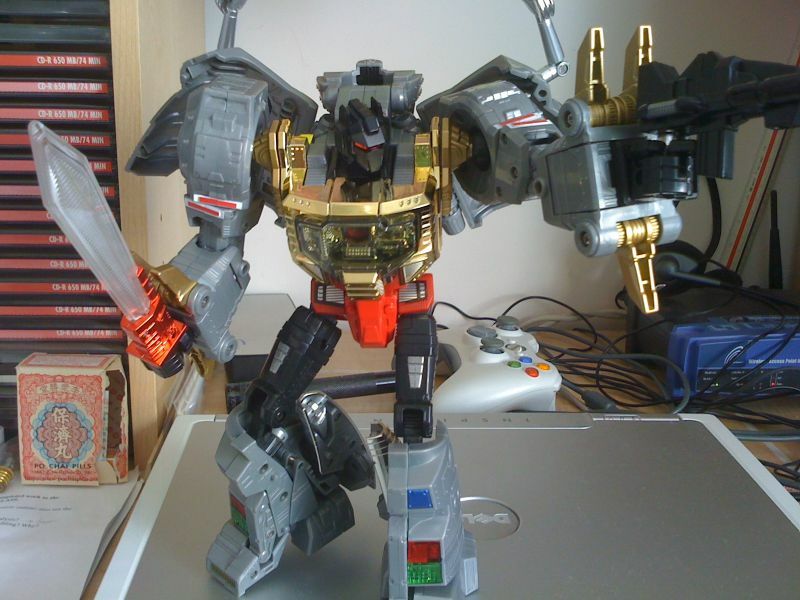 Grimlock is glorious. 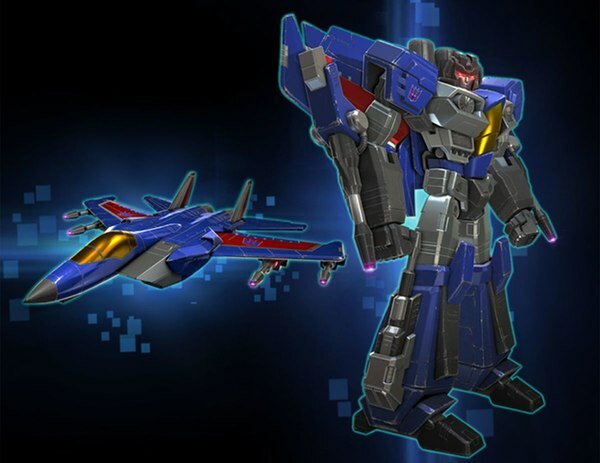 He isn’t the marvel of engineering that Masterpiece Starscream and his variants or Megatron were, but then he doesn’t share the seekers’ cluttered robot mode as well. 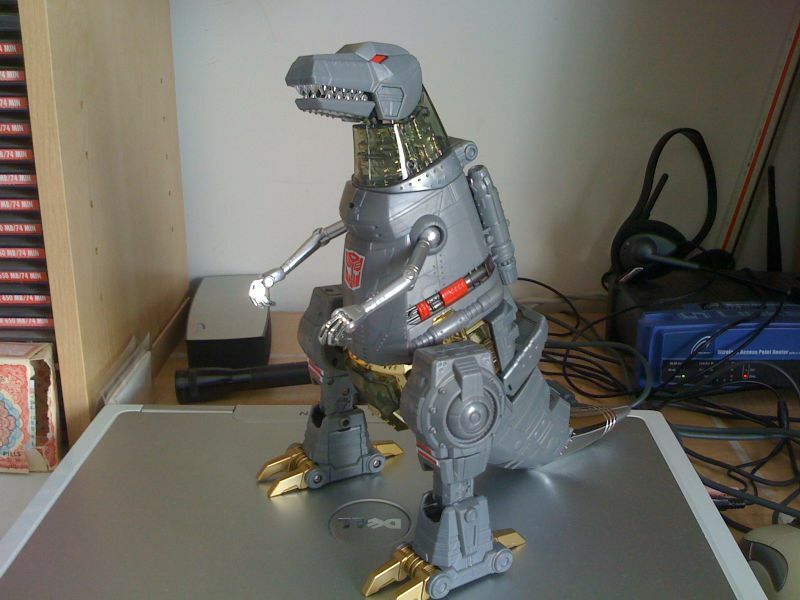 Grimlock is simple - his transformation requires few steps and could *almost* be done without instructions. A lot of the steps will be throwbacks to his G1 toy, which makes playing with this guy very nostalgic. Because of his simplicity, he feels a lot sturdier than Starscream, although I don’t know how he is compared to Megatron, and I feel less hesitant to pick him up and fly him around the room. His simplicity really helps his presentation. I speculate that his detailed overall appearance and G1 aesthetics were made possible because of his comparatively simple design – few folding panels, using the dinobot legs for arms, the tail to leg transformation, etc. For the die-cast fanatics, there isn’t much here. 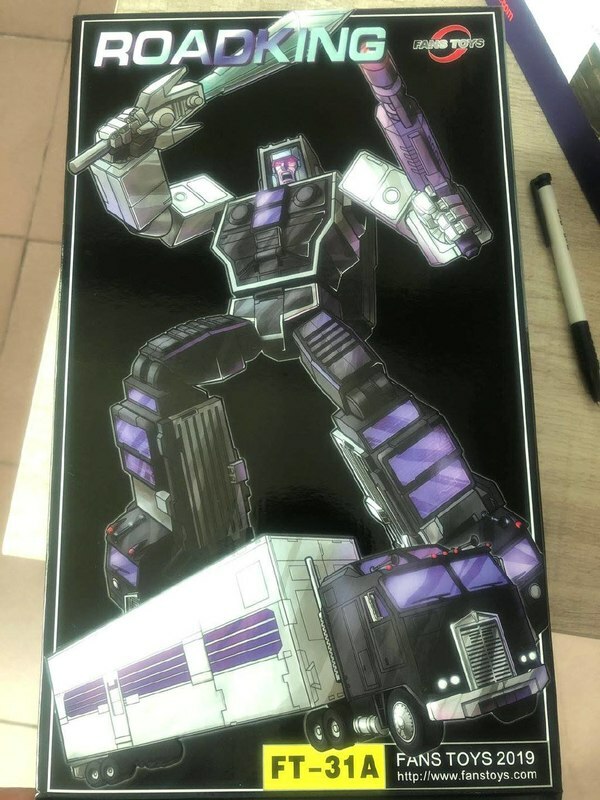 I don’t think we will ever see an MP Convoy/Optimus level of die-cast anymore in this figure line, but that doesn’t bother me...much. The swing bar his robot chest/dino legs are attached to are metal, as are the golden claws and his red crotch. There are some spots were die-cast could have been very beneficial to the durability of this figure, such as the knee joints. The plastic joint does not look like it could hold up to a lot of heavy play. In the end he is still worth getting. His awesomeness does outweigh his faults and his NA price point - currently at 69.99CAD - is much more affordable than his JP one. In the end, you get the same quality release, sans a few obscure accessories and the addition of the crown.